You are here: Home / Weight Loss / My Sugar Free Story! Have you ever tried going sugar free? It might be easier than you think! 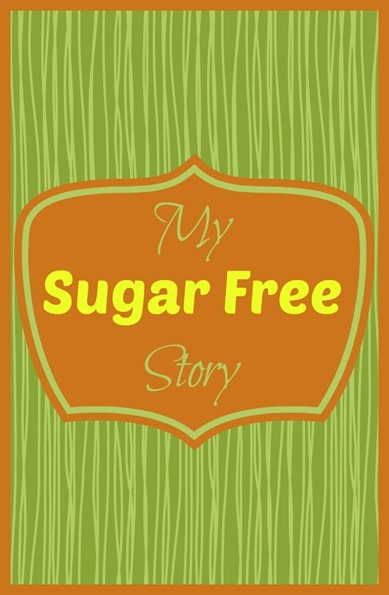 Here’s My Sugar Free Story. I have mentioned before that about 4 years ago I was diagnosed with Type II Diabetes when I was preparing to have surgery on my Achilles tendon. I lost over 100lbs and was able to quit taking the meds and have been since then living almost carb and sugar free. It has worked great, all of my numbers are great. Except I gained 20 lbs over the last 8 months and have NOT been able to get it off no matter what I tried. I was eating less and less trying to get it off and it wasn’t working and I was becoming more and more frustrated about it. Recently, Hubby began to explore a no fructose lifestyle. He immediately started losing weight as he removed fructose from his diet, I was shocked. Then again, men lose faster than women… :/ The more he studied it, the more convinced he became that it would be good for me, as well. I always wanted him to eat carb and sugar free so we could eat at the same places, the same way and buy the same food. So, I thought ok I will try it and keep an eye on my blood sugar to be sure it didn’t go up. So, I did. I have been on it for a week now and I am beginning to lose weight – yay! I am eating MORE! That was shocking. I am also eating carbs – I had mashed potatoes one night and hash browns one morning… it may not seem like much to you – but, go 4 years without and then tell me! lol My blood sugar responded well to the carbs. this whole thing is blowing me away! Another nice side benefit is that hubby and I are spending more time in the kitchen cooking together and trying and creating new recipes to fit this new lifestyle. I feel great, my body is functioning better than I feel it has in a while. Hubby, as I said, has studied it more than I, but in a nutshell – your body doesn’t really know where to send fructose when you eat it. It knows how to deal with all of the other things we eat because they are food. Fructose is added to almost EVERYTHING and it is definitely harder to find the fructose free foods, but they are out there. The other day at Whole Foods we looked through about 15 different packaged bacons AND the ones at the butcher counter and found exactly 1 that had no fructose (or sugar because there’s fructose in sugar). To give you an idea of how Fructose or sugar is in EVERYTHING – we were cooking the other day and Hubby grabbed the Garlic Salt and seasoned something and then looked at it…. it has sugar in it – why? I don’t get salt needing sugar. We bought dextrose to use for a sweetener, it is pure glucose and the body knows where it goes when we ingest it. It’s much less sweet than sugar, so you use more. But, after a few days not eating fructose EVERYTHING tastes sweeter! I had a tomato in a salad the other night that I could have sworn had sugar on it! So, I will be sharing my journey here,as well, if you’re interested – stay tuned! Hubby has started a site all about his journey. It’s new but, he will share what he learns and experiences along the way! He is also trying to provide lists of what is fructose free at restaurants to better help us determine what and where we can eat. So far, restaurants have been very helpful in telling us what has fructose/sugar and what doesn’t. Thanks for sharing. Very interesting. But I must be missing something. If you were already sugar free, wouldn’t you also be fructose free? I mean that is a sugar. Do you not eat fruit now also? I mean, that’s a real food and it’s full of fructose. Maybe we’re thinking of different things. Just thought you might be able to clear up my confusion. 🙂 GL in your journey. Thanks for asking. I was not eating sweets or carbs, I was still using sugar in my coffee. But, EVERYTHING has Fructse in it, as an ingredient. I hadn’t removed that – I mean it’s in Mayo and Ketchup, some Garlic salts, meats, a rotiesserie chicken we picked up from the grocery store – everything. So, I wasn’t even looking at Fructose at all, I was looking at plain table sugar or desserts and things like that. Now I have removed Fructose as a whole from my diet, except for a small amount of fruit occassionally. Fruit has Fructose, but it is surrounded by a ton of nutrients that are there to help your body handle it. When it is put directly into foods without using that same model the body is at a loss as to how to really handle it. Another thing I found fascinating is that my taste buds have changed. Food tastes sweeter now, I think the fructose and sugar added to everything has caused me to not be able to taste the natural true flavors of things. Thank you so much for sharing this. I appreciate all that you and your husband have done with your website. You both are blessings to many people. Thank you, again!!! You’re very welcome and thanks so much for the kind words! Hi! Sooo, everyone has their opinion, and I have mine. I’m not trying to be rude, but I’m just telling you what I know through my experience. I’ve been high carb low fat vegan for over a year now. I eat TONS of fruit and potatoes and rice. Zero meat, dairy, or eggs. I’ve lost 15 pounds, (I wasnt that big to begin with), and I feel healthier and lighter than ever! I don’t count calories and I eat in abundance! On average, I probably eat about 2500 calories a day. Fruit is pure fructose, which isnt a problem because your body thrives on sugar and carbs. Every cell in your body needs carbs to survive. Have you ever heard of anyone getting fat on fruit? I havent! The problem isnt the fruit or the starches, it’s the fat that comes with the meat and dairy! I looked at your husband’s blog and all the recipes have meat and butter and cheese. I’m not just aiming for weight loss, I’m aiming for health. I know you are diabetic but again, the problem is fat, not carbs. To find out more about this, I recommend reading Dr. Grahm’s book, “The 80/10/10 Diet” and also checking out the YouTube channels of FullyRaw Kristina and Freelee the Banana Girl. I’ve been where you are, desperate to lose weight and tone your body. I was restricting calories and exercising like a mad woman. Now I eat unlimited calories, exercise 30 minutes, 5 days a week and have tons of energy to live and love life!